Here’s news of another hefty price drop as Robert Shepherd at Edmiston & Company and Merle Wood and Peter Croke at Merle Wood & Associates see a $4 million cut on their joint listing, the 62.33m motor yacht Fortunato. Lloyds classed and MCA compliant, Fortunato was custom built in 2000 by Feadship’s Royal Van Lent yard to a design by naval architect De Voogt. This superyacht has a steel hull and an aluminium superstructure. She is fitted with a modern Koop stabilization system that reduces roll motion effect, resulting in a smoother cruising experience. Up to 14 guests can be accommodated in a master suite and six double staterooms. Power comes from two 2000hp Caterpillar diesel engines, which provide a top speed of 17 knots and a range of 5,800 nautical miles at 13 knots. 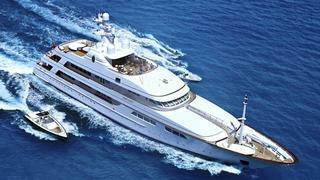 Subject to a multi-million dollar refit in 2011, Fortunato is now asking $54 million.